I know it's not Christmastime just yet, but I just can't help myself from getting excited about all of the holiday festivities. I mean if stores have been decorating for Christmas and blasting holiday music since July, why can't I? I could be wrong, but in this case I don't want to be right. I remember the excitement building up to the holidays as a child, and as a parent it is even more fun. I love seeing the holidays through my kids eyes, and getting the chance to experience a little bit of that magic with them. Last week we embarked on our first little holiday adventure. I figure we made it past Halloween so now all restraints are off. 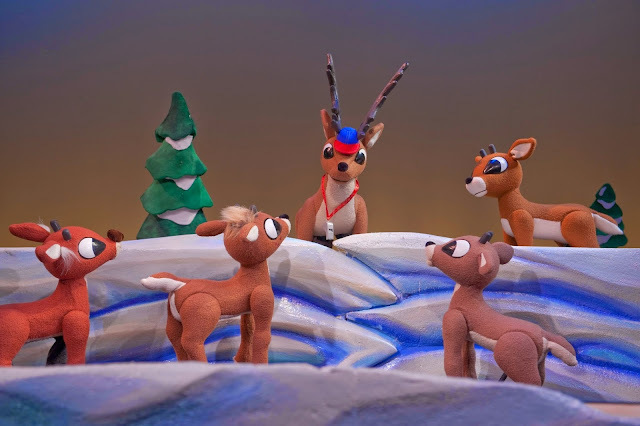 We were invited to check out the Rudolph the Red-Nosed Reindeer™show at The Center for Puppetry Arts. It had been cold and rainy, and I thought it would be the perfect activity to take the girls to while Cute was in school. I hate that he wouldn't be able to attend with us, but his break doesn't start until the Friday before Christmas, and our weekends are jam packed until then. 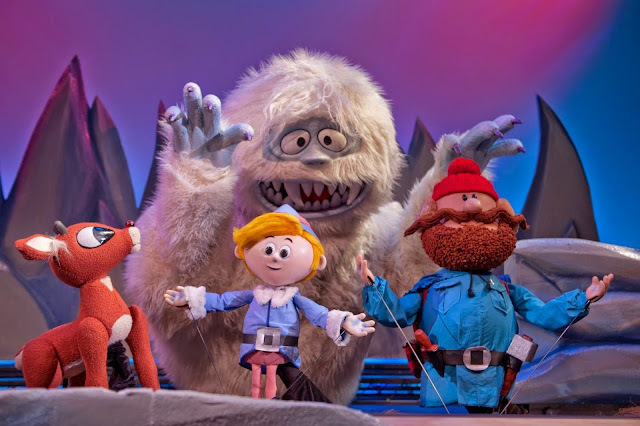 We love all the productions we've seen at The Center for Puppetry Arts this year, and I knew they would do an awesome job portraying this holiday classic. The girls couldn't wait to see it! I dressed the girls in their Rudolph themed holiday dresses (You didn't think I would pass up a chance to don some coordinating theme wear, did you? ), and we headed out the door for the morning show. L.C. was beyond excited, and showed off her calm and quiet personality to everyone before the show started. I wonder if they are looking to hire dramatic four year olds for their warm up act? We were escorted to the front of the seating area and had such a great view of the stage! The girls loved being up close and personal with all of the puppets. It's a longer show (approximately an hour) so I think this helped to keep their attention. The show captured the classic story beautifully. The puppeteers did such a great job with the voices you almost thought they were the original voices of the original stop motion movie we all grew up watching. B.C. started to fade at the end of the show, so I would say while it is great for all ages, a not quite two year old might have some trouble sitting through it's entirety. After the show ended, we made our way upstairs to the Create-A-Puppet workshop area. My kids all love this part of the visit, and they couldn't wait to see what puppet they would get to create this time. This time they were able to build their very own King Moonracer™ Rod Puppet. B.C. allowed me to put hers together and then she decorated it. She is still a little young to get the whole concept of how it works, but girl doesn't love to perform on the stage. I wonder if they are hiring rambunctious and wild two year olds as their closing act? L.C. on the other hand takes her puppet making, and performing quite seriously. We are always the last ones to leave the room and even then I have to tear her away from putting on the "finishing touches" to her puppet. After I was finally able to coerce her to leave the workshop area we made our way back down to the lobby area so that she could continue her performance. The lobby has this fun little puppet theater and seating area set up for children to play with and interact with their puppets. Usually we take this time to tour through the museum a bit, but the girls were so happy playing here, and reenacting their favorite parts of the show. We even met a friend during our workshop time who joined us. This sweet mom and her daughters I had seen at a previous show, and we have girls the same age, so we all introduced ourselves. It was such a fun way to end our visit and I loved that we made some new friends along the way. If that isn't what the magic of Christmas season is supposed to be about, I don't know what is. 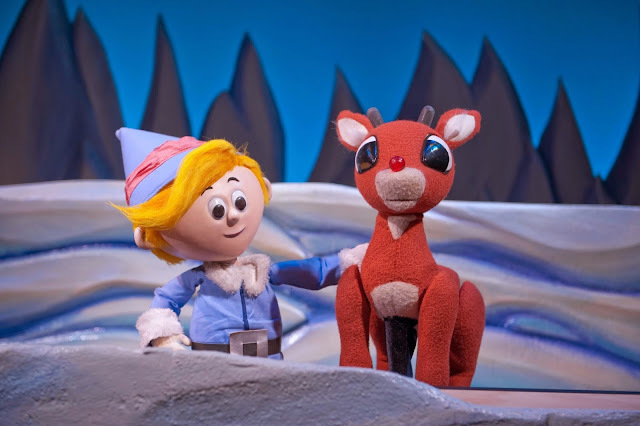 If you are in the Atlanta area - or plan on making a visit soon - I would definitely put the Rudolph the Red-Nosed Reindeer™on your list of holiday events to attend. The show will be running at The Center for Puppetry Arts from now until December 25th. It's a great way to celebrate the holidays with your little ones and to share the classic Christmas hit. What holiday events or traditions are you looking forward to sharing with your kids? **Thank you to Brave PR and The Center for Puppetry Arts for providing media tickets for this post. All thoughts and opinions are our own.